In the last three years, Hertz made way less money than it originally thought. In a filing Friday morning, Hertz announced that it will restate three years worth of its earnings statements, reducing its GAAP net income by 18%, 14%, and 6% for its 2011, 2012, and 2013 fiscal years, respectively. On a dollar basis, the company’s GAAP net income will be reduced by $US32 million, $US35 million, and $US20 million for 2011, 2012, and 2013. So, the company made $US87 million less than it previously said. 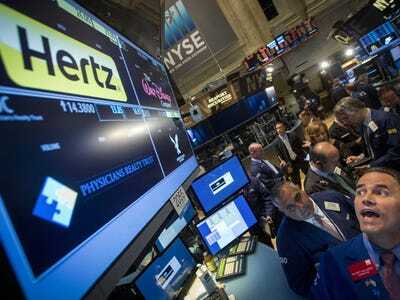 Following the news, Hertz shares were down more than 8% in early trade on Friday. Year-to-date, the stock is down about 25%. Friday’s restatement comes after the company said in August that it was withdrawing its financial guidance for 2014 and that it would conduct a review of its results for its 2011-2013 fiscal years. Although the review and investigation are ongoing, the Audit Committee, in consultation with management, has concluded that the additional proposed adjustments arising out of the review are material to the Company’s 2012 and 2013 financial statements. Therefore, in addition to the 2011 financial statements, the 2012 and 2013 annual and quarterly financial statements must be restated and should no longer be relied upon. The Audit Committee has discussed this matter with PricewaterhouseCoopers LLP, the independent registered public accounting firm for Hertz. In addition to the 2011 financial statements, as previously disclosed, the further requirement to restate the 2012 and 2013 financial statements will further lengthen the period for completion of the applicable accounting and audit activities. Hertz does not currently expect to complete the process and file updated financial statements before mid-2015, and there can be no assurance that the process will be completed at that time, or that no additional adjustments will be identified. In a separate press released on Friday, Hertz announced a new $US100 million cost reduction plan. In August, activist hedge fund manager Carl Icahn disclosed a more than 38 million share stake in the company and said in his filing with the SEC that he plans to have discussions with company management. It seems Icahn and Hertz will have a lot to talk about.